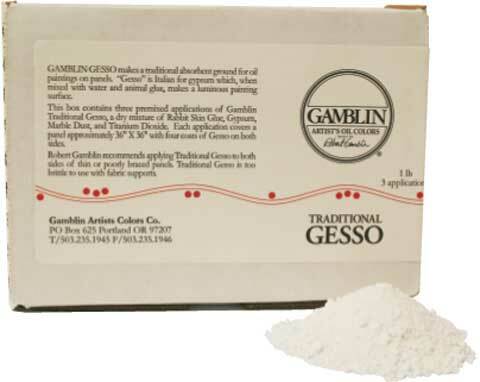 Gamblin Traditional Gesso is a dry mixture of rabbit skin glue, gypsum, marble dust, and titanium dioxide. Robert Gamblin recommends applying four coats of Traditional Gesso to both sides of thin or poorly braced panels. Traditional Gesso is mixed with water and applied to panels, but it is too brittle to use with fabric supports. Paintings on gesso (either traditional or acrylic) are more matte because of the high absorbency. In a 1 lb. container. This product has been discontinued by the manufacturer, and we will not be able to get any more once our stock runs out.